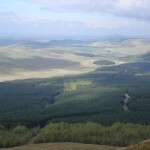 5.5miles NE of Newcastleton off the B6399. OS Ref: 74 NY 494 961. It is open from April-September, seven days a week from 9:30 am – 6:30 pm. During October and November it is open from 9:30 am – 4:30 pm and closed on Thursday afternoons, all day Friday and Saturday mornings. 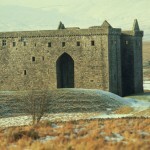 See a YouTube video photo montage of Hermitage Castle. 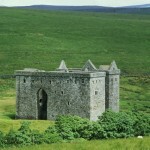 Hermitage Castle, photo from “The Steel Bonnets”. 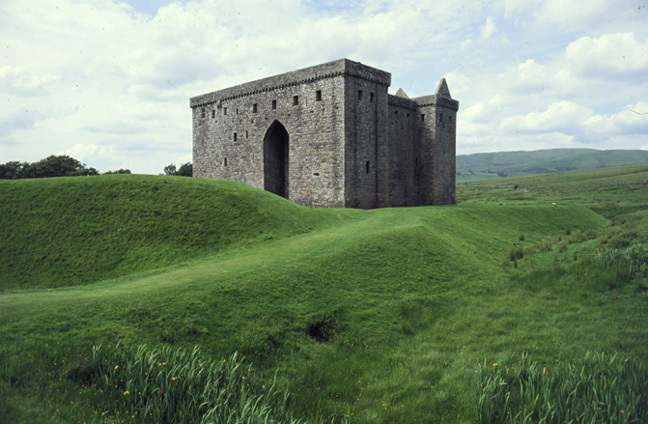 “Hermitage, ‘the chief strength of Liddesdale’, must be one of the most sinister-looking castles ever built. 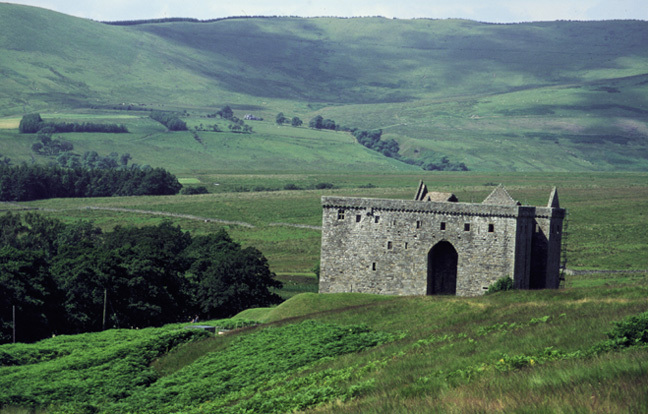 It stands actually in a smaller valley off the main dale, and even without its roof and with its interior in ruins, it retains a most grim and depressing atmosphere: visitors are not surprised to learn that one of its earliest owners, a lord named de Soulis, was reputedly a magician who had sold his soul to the Devil, and was punished for his crimes by being boiled alive in a great cauldron. The isolated valley of the Hermitage water, is said to have been the home long ago of a holy man of God. It is certainly a lonely spot. 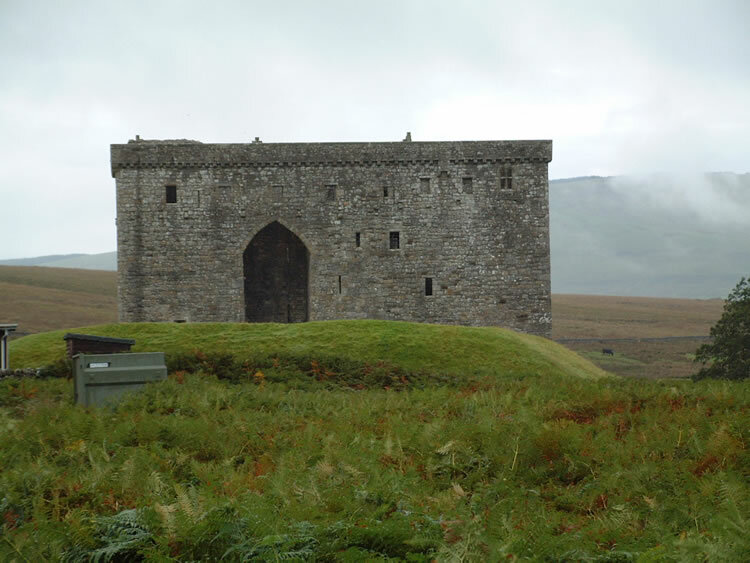 The feeling of foreboding is heightened by the presence of the awesome castle ruin, the inspiration of local legends, of the wicked Lord Soulis and of a giant with impregnable armour. In truth, though, Hermitage needs no myths. 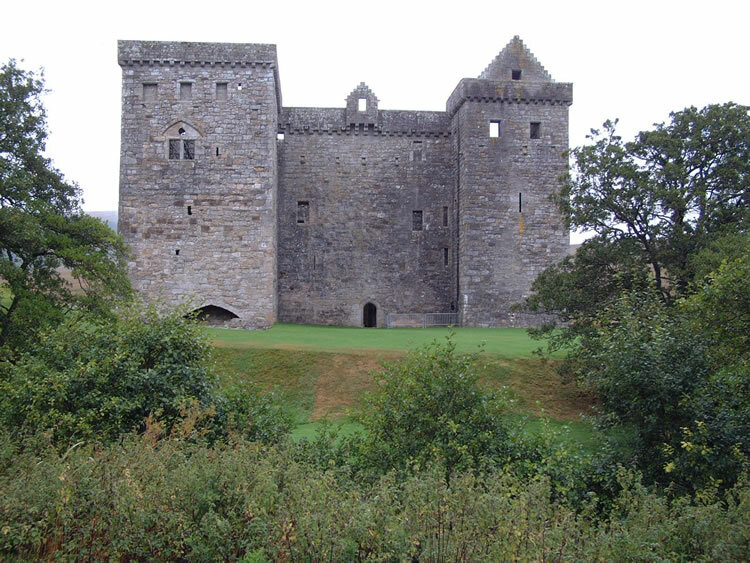 It already has a history of family murders, illicit affairs, romantic trysts, torture, treason, and intrigue sufficient for a host of castles. 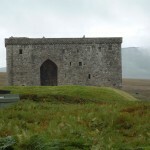 For most of its 400-year existence, Hermitage – ‘the strength of Liddesdale’ – was the key to control over much of the Border country, “the guardhouse of the bloodiest valley in Britain” and as such it was highly prized and much fought over. 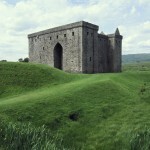 Even the building of it in 1242 brought England and Scotland to the brink of war. That first timber castle has gone, but the mighty earthwork defences remain. 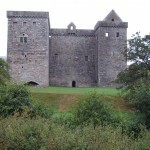 The present stone castle took shape gradually over the course of the later 14th and 15th centuries. 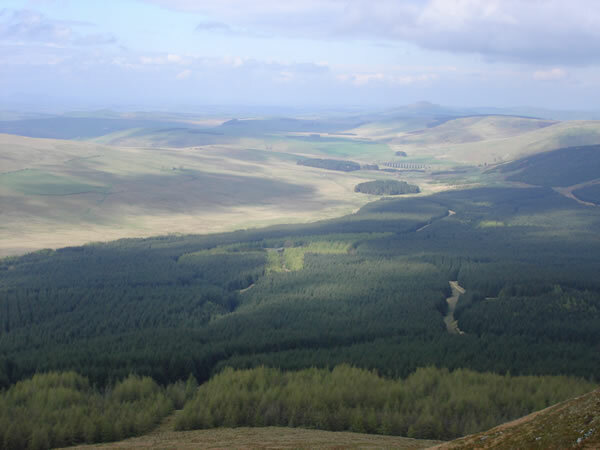 Begun by the English Lord Dacre, it was remodelled and greatly enlarged by the powerful Scottish noble family of Douglas and Angus. 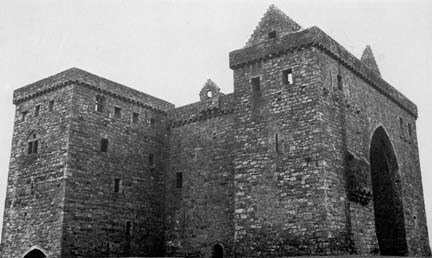 Later, the castle passed to the Earls of Bothwell, ad it was during their ownership that Hermitage was the scene of one of the most well-known adventures of Mary Queen of Scots, in the course of which she almost died. 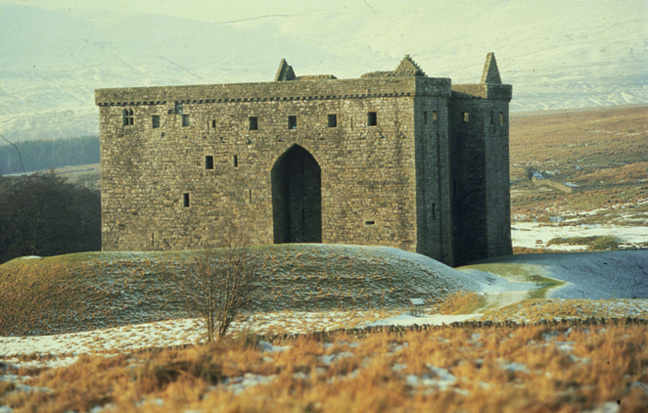 As the arrival of gunpowdered artillery changed the face of warfare, so great castles like Hermitage lost their advantages. 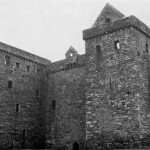 Attempts to modify defences, such as the great ravelin that dominates the castle’s western approach, were never destined for success. 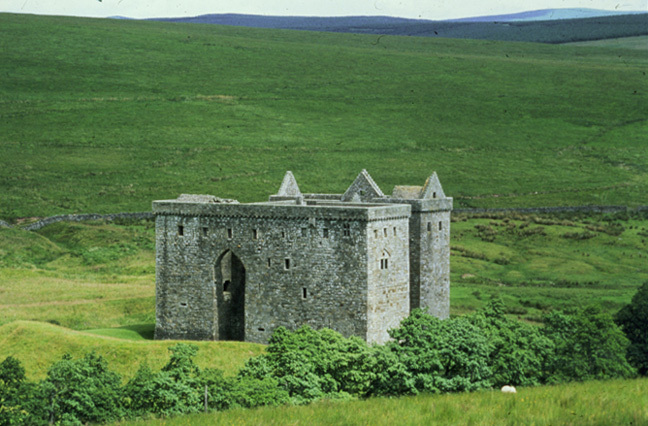 The place was probably forsaken as a noble residence by the 17th century and gradually decayed until the haunting ruin in its lonely site beside the Hermitage water became a magnet for Sir Walter Scott and his contemporaries. Information © Copyright, Historic Scotland.